As the author of more than 35 volumes of poetry, children’s literature, fiction and non-fiction works her books have been published in more than 40 languages. Throughout her literary career she has been given numerous awards and honorary degrees and has been shortlisted for the prestigious Booker Prize several times, winning it once for her novel ‘The Blind Assassin’. 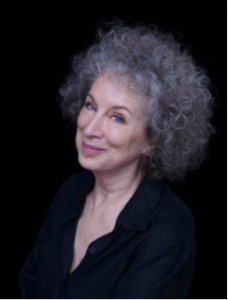 She is well-known for writing science fiction – which she prefers to call speculative fiction – and dystopian fiction, such as ‘The Handmaid’s Tale’, set in the fictional republic of Glead, a place where women are not allowed to read. She has repeatedly made observations about our relationships with animals, particularly in relation to our consumption of them, in her novels. Influenced by her upbringing with father Carl and his work in the forests of Ottawa Margaret developed an abiding concern for the environment and the well-being of the planet and is a keen advocate of recycling and re-using materials, in particular ‘Ancient Forest-friendly’ paper and resources and of using 100% ‘green’ energy. She and Graeme Gibson, who is her partner are members of the Green Party of Canada and are strong supporters of its leader Elizabeth May. They also support other causes, and jointly hold the post of Honorary Presidents of Birdlife International’s organisation, the Rare Bird Society. In 2004 she created the LongPen. This device, which made its debut in 2006, enables a person to remotely write, in ink, anywhere in the world via the internet. Margaret has fans on all continents and this invention allows her to meet and sign books for her admirers from her own home. She has lived all over the world but now lives with her partner in Toronto.